Curt Crool’s son proudly holds a nice-sized bass, one of 35 he caught while working a suspending gold/orange Rogue on a bitterly cold January day with John Dean at Toledo Bend. It looks like we’ll have more of a winter than we usually do after all, and it’s apparent we’ll have more water than what predicted a few months ago as the calendar turns to January here at Toledo Bend. By early December, there had been a couple of major cold fronts already, with more on the way. Those recent fronts have brought excessive rainfall that raised the water level, which had risen above 170 feet. It had been reported that officials would hold the lake steady at 168 feet through next April to work on the other side of the dam, where huge boulders weighing a ton are being trucked in two at a time from Kentucky. But they are limited to how much water they can let out now and still get the job done efficiently and safely — so here we are, 1 foot and 5 inches from full pool at Toledo Bend, which I really didn’t anticipate going into the New Year. But I enjoy the water being this high. A lot of people do. And it bodes well for fishing in the bushes this spring. 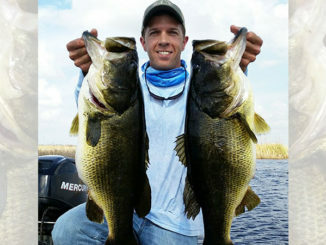 Heck, I wouldn’t be surprised if bass are caught out of the bushes up north in January. The water level should warrant some bush activity shortly if not now, as more rainmakers hit the region. Surprisingly, it was in the 70s for quite a few days late this fall, but we’ve already had some stretches of temperatures in the 30s. I believe that’s what we’re going to have the rest of the winter, and January should be a roller coaster month if the weather patterns continue. Pick the warmer days and fish late-morning on, and you should be able to catch bass shallow as well as deep. Yes, I said shallow, shallow in the heat of the day. January will be a roll-the-dice situation. 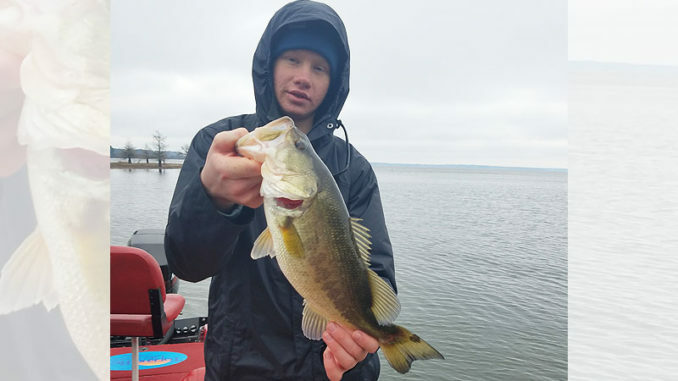 Bass can be shallow from midday on in the back ends of shotgun pockets and creeks, especially the last two or three weeks of the month when the lake should have some bass move up and sit on beds. 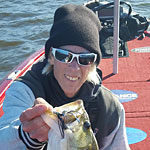 As we get closer to the prespawn period on this great lake, don’t be surprised to see double-digit bass caught. Those big girls don’t require optimum water temperatures to lay their eggs: When they’re ready to go, they go. Bass will be caught deep, too, on jig-n-pig combinations, dropshots, tailspinners, jigging spoons and whatever your favorite deep go-getter might be while relying on marine electronics. There probably is more consistency on larger bass, finding them in and around the deep brushpiles deep in the winter, but remember they don’t always eat. I’ve been catching bass consistently the past few weeks in the back of creeks and coves, where it’s darned picturesque and the men, women and children are awed by the beauty. With more water in the pond, we can get back to those scenic areas. The bass have been there in 5- to 7-foot depths and willing to bite black and watermelon Flukes (I’ve been dead-sticking them for best results) and, especially, gold/orange Rogues. Both should continue to be major players in January. I remember one rewarding trip on a cold January day with Curt Crool and his son, who caught 35 bass averaging 2 ½ to 3 pounds while letting a suspending gold/orange Rogue do just that, with long pauses during the retrieve. That young man was locked in. Top colors for soft plastics like the Flukes eventually will change predominantly to watermelon/red and green pumpkin/red. 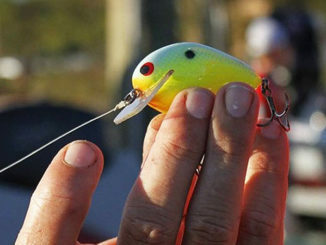 During the latter part of January, another top artificial lure for getting bass to bite is a ½-ounce Rat-L-Trap. Reds are the top colors the closer it gets to the spawn, but until then you can mix it up with some shad-colored Traps and see what they prefer on your trip. White perch fishing has been fair at best, with catches of 20 to 25 common on shiners over brushpiles in 20- to 25-foot depths. They will be caught on both shiners and jigs in January. 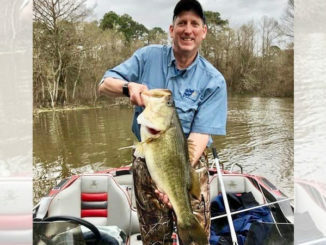 If you want to catch bass this month, when the bassin’ should be fair to good despite some cold spells, I’ve been guiding on this lake most of my life and you’re always welcome in my boat. Give me a call at (936) 404-2688.